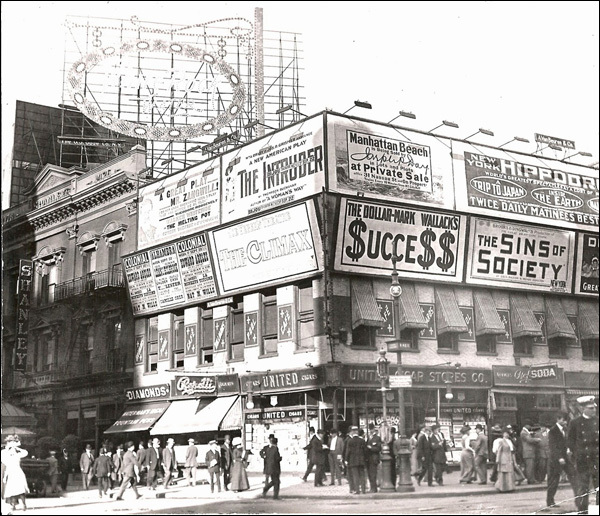 Broadway and 42nd, around 1909. There's a lot here; if you want to skip to the next page, just click here. Can you tell what this sign advertises? No? That doesn't narrow anything down; White Rock was sold all over the place. Shanley . . . hmm. A theater? No. 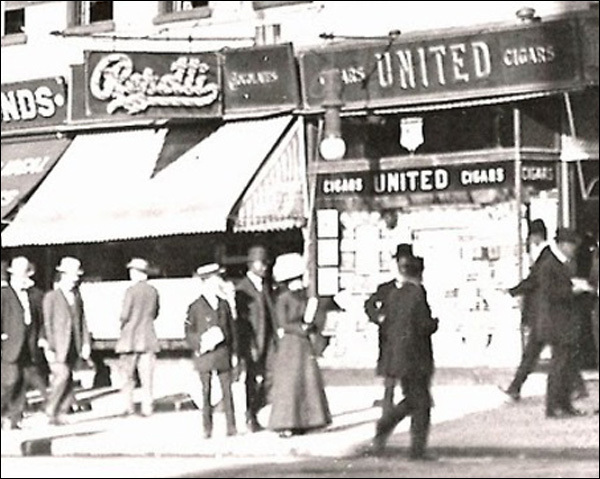 A chain of restaurants that fed the swells between 1890 and 1925. Ah, but that doesn’t narrow it down. There were six. Which one is this? Thank God for the New York Public Library’s collection of menus: it provides some data, such as the locations of the restaurants. 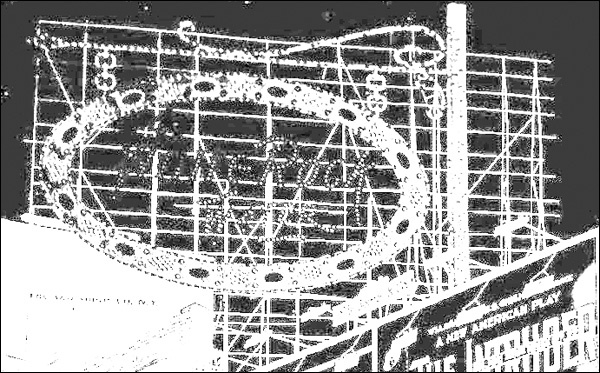 There's one at at 1476 Broadway, which matches the numbers at the top of the building. Shanley's, indirectly, was a motivating factor in the creation of ASCAP, today, one of the most powerful unions in the entertainment field. 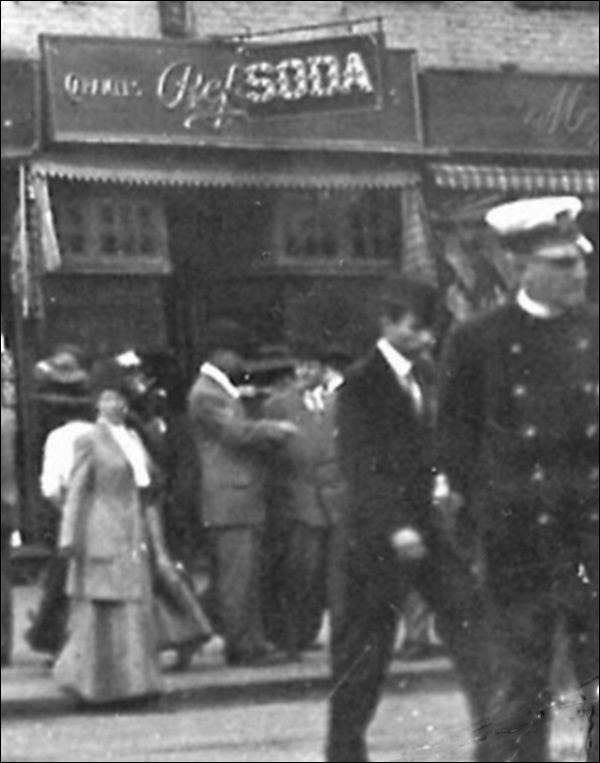 Victor Herbert was dining at Shanley's, listening to the orchestra play a medley of his compositions, when the waiter handed him a staggering check. "You've charged me for every item on the menu, apparently, and I am paying the bill? But how much are you paying me for playing my compositions? The answer, of course, was "nothing." With this, Herbert sued Patrick Shanley, for the illegal use of his compositions. The suit went all the way to the Supreme Court, where Oliver Wendell Holmes ruled in favor of Victor Herbert and as a result, ASCAP was founded. The law survived Shanleys, of course. Wikipedia is our friend, again. Zangwill's work earned him the nickname "the Dickens of the Ghetto". He wrote a very influential novel Children of the Ghetto: A Study of a Peculiar People (1892). 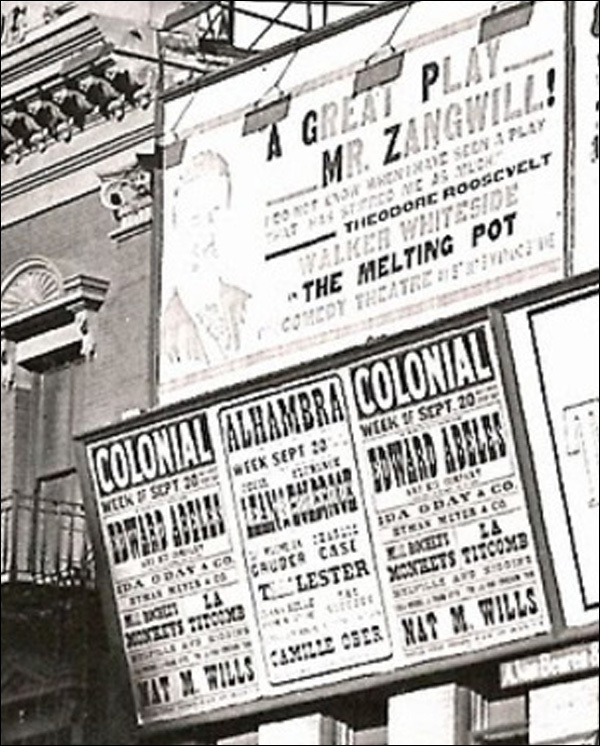 The use of the metaphorical phrase "melting pot" to describe American absorption of immigrants was popularised by Zangwill's play The Melting Pot, success in the United States in 1909–10. Edward Abeles: Edward Abeles (November 4, 1869 – July 10, 1919) was an American actor. He appeared in 8 films between 1914 and 1918. Prior to working for Famous Players-Lasky, of which he was one of the founding members, he had a lengthy stage career behind him. He starred in the 1906 Broadway hit Brewster's Millions. He then later starred in the first film version of the play, directed by Cecil B. DeMille. And then there's Mr. Wills. Nat M. Wills (July 11, 1873 – December 9, 1917), was a popular stage star, vaudeville entertainer, and recording artist at the beginning of the 20th century. He is best known for his "tramp" persona and for performing humorous or satirical musical numbers, including parodies of popular songs of the day. All these years later, you can still call up their bios in a trice. As for the plays themselves, probably not. They're probably crap. Thompson Buchanan (June 21, 1877 - October 15, 1937) was an American writer. While a journalist he began writing novels, and then turned to plays, with 1909's A Woman's Way starring Grace George being his first hit. He began writing for movies in 1916, and also wrote radio sketches. Ding ding ding ding ding! 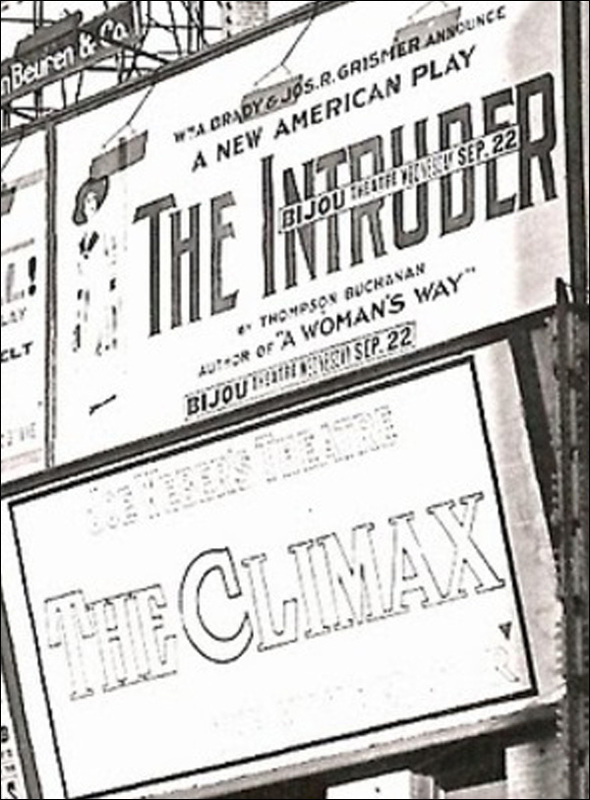 “The Intruder” was produced in 1908. So now we know where, and when. 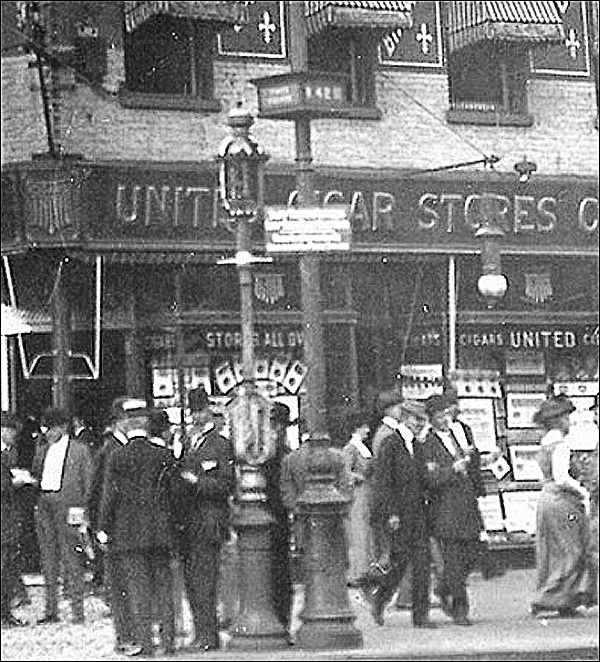 The ubiquitous United Cigars, and something I first thought was a restaurant or bar. I can’t say if it’s Resetti or Resotti, but that second word, I believe, is . . . chocolats. Well, if I’d thought about looking at the street sign to get the location, I would have saved myself some trouble. l Iove that picture. It’s so ordinary. I guessed at the name, googled it, and aren’t I clever clogs: News from the Catskills paper. While in New York City recently Hugo Gorsch of the Gorsch furniture store supplied the furniture for the large real estate offices of Jasper P. Day. The order was a large one. 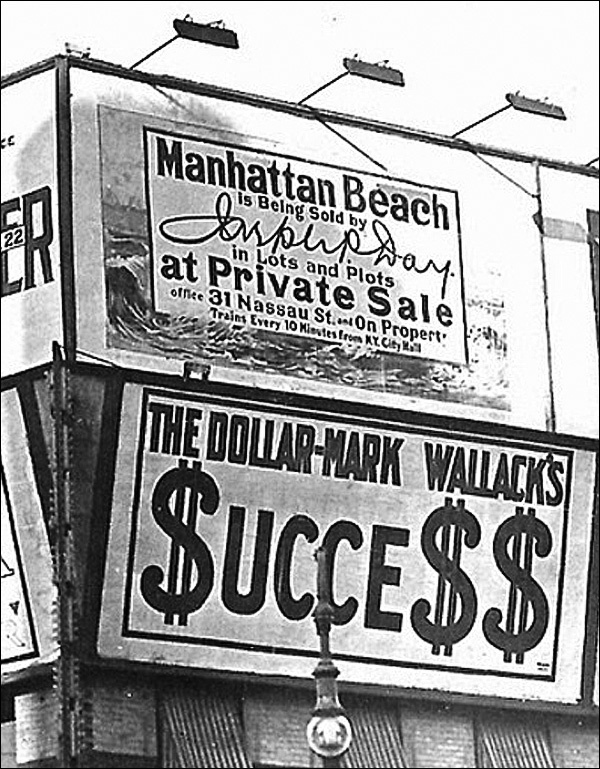 The Dollar Mark was a play that ran at Wallack’s from August 1909 to October. Not that much of a success, perhaps. But that narrows down the date. 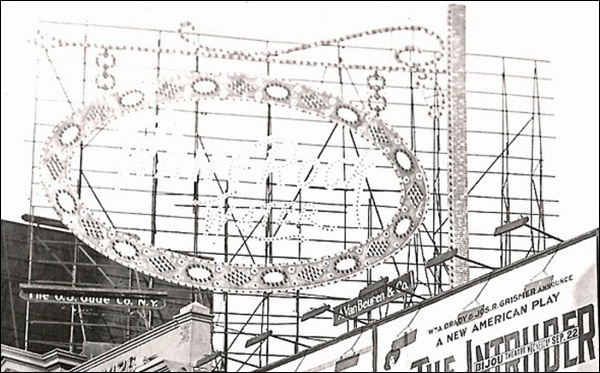 It was written by George Broadhurst, who still has a theater named after him. And that’s the only piece of any of this that still exists. Well, Manhattan Beach, but you know what I mean. One more, so we can leave on a mystery. The sign seems to say Ref something. 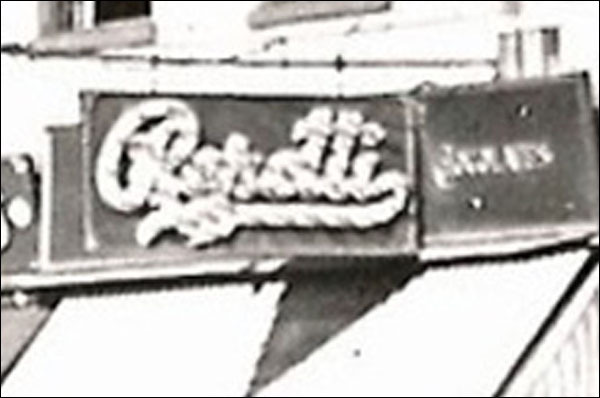 It looks like the same sign as the chocolate store. It’s possible the the store had two outlets, or were connected, or were different. So much we don’t know, although I suspect that fact could be discovered. As for what’s caught the policeman’s eye? That we’ll never know.